Every year, steadily, "the lone veteran of the 3rd Inf. Div." living in Rome is present at the Landing Anniversary of Nettuno on January 22. The ceremony is organized by the two City Halls of Nettuno and Anzio with the participation of the Italian Army officials and Civil authorities. It takes place with a representance of the Italian War Veterans in front of the Memorial War Cemetery of Nettuno. 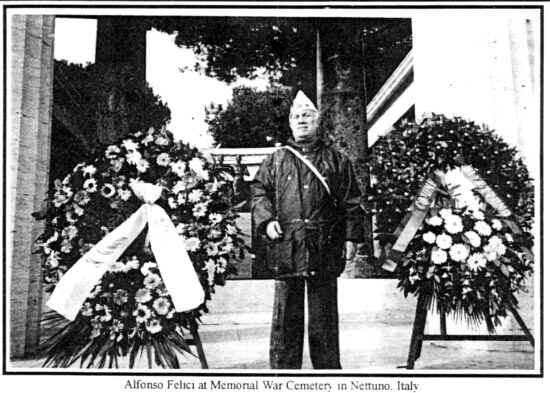 Mayor Vittorio Marzoli of Nettuno and Mayor Candido De Angelis of Anzio with their speeches, exalt the sacrifìces of our fallen comrades buried at the Cemetery. While the TAPS notes peal in the silence I salute our Buddies who gave their lives for the cause of Liberty. I wish to thank our President, Martin A. Markley who awarded me the Certificate of Appreciation, in recognition of continued dedication and contributions for the Society of the Third Infantry Division. Be assured, Mr. President, I will be an alert sentinel at the beachhead representing our Comrades of the 3rd. Being a Veteran ofthe 3th Infantry retired in Rome I faithfui continue my missiom for ten years on taking Veterans visiting Rome to the Battlefield of Anzio-Nettuno and even find their foxholes. Many of my Buddies remember me as 'The Fighting Paisan" nicknamed by War Correspondent Ernie Pyle during WorId War II. Honouring my mission as a guide to the Battlefìeld I welcome every Veteran visiting Rome to contact me and I will proudly assist them. Thanking you for your courtesy to print this letter in your next issue of The Watch on the Rhine. I take chance to say hello to John Shirley, Mario Lucido, Fred Scarpa, Tom Wright, Richard Guimond, I. W. La Londe, N.L. Snowden, Anthony Di Gennaro, Joseph W. Herron, my buddies. Again I urge Veterans of the 3rd passing by Rome to not hesitate to call or write me. I am honoured to take them at the ditches of Isolabella, Femmina Morta, Canale Mussolini, Dairy Farm.